Security: We use the latest security technology to assure that your information is fully protected. Orders are placed using Secure Socket Layer (SSL) encryption. This is the industry standard for protection on the internet. SSL security provides data encryption, server authentication, and message integrity. SSL is built into all major browsers and Web servers. Simply installing a digital certificate turns on these capabilities. Onestopfanshop uses 128-bit encryption to assure your protection. Safe Shopping With OneStopFanShop, Inc.: Along with our SSL encryption we provide you with several other layers of protection. We are PCI DSS compliant. All credit card orders are processed by Paypal powered by Braintree. Paypal powered by Braintree is an industry leader in credit card protection. 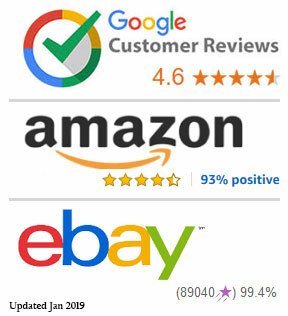 They verify your information directly with the credit card company as orders are processed. All PayPal payments are protected via each respective company. Further, under the Fair Credit Billing Act your bank cannot hold you liable for more than $50 of fraudulent charges. In the event of an unauthorized use of your credit card or payment info you must notify the provider in accordance with its reporting rules and procedures. Information Automatically Collected: Similar to most web sites we collect certain non-identifiable information regarding your use of the website. This information may include but is not limited to: IP address, date and time of site access, sites previously visited, link or search used to access the site, the operating system you are using, the areas of the website you visited, page views, time spent on site, etc. Cookies: Cookies are data files that install a small amount of information to your computer when you visit a website and permit the server to identify your browser. Cookies enhance the convenience and use of the site. They contain identification information that enables us to streamline your experience. They do things like recognizing previous use of the web site so you do not have to enter information more than once. You may choose to delete cookies at any time. You may also choose to reject cookies. However, doing so will require you to reenter information every time you use our services, and might affect your ability to access certain features of the site or engage in transactions through the site. Tracking Information: OneStopFanShop, Inc. may collect non-personal information regarding your traffic patterns, demographics, and purchases. This information is used solely for research & development by our site administrator. It will not be shared with any third parties. If you would like to block this collection, please use a private browser, browser with cookies disabled, or we encourage you to use Google Analytics' currently available opt-outs for the web. In order to complete a transaction with us you will be asked to provide certain personal information. This information is can be categorized as required or optional. This is the basic information necessary to complete a transaction. The email address is used for communication purposes. We will provide you with a receipt and order tracking information via email. The phone number is necessary in case the delivery service has difficulty delivering your package. All personal information provided in this section is only stored as long as is necessary to complete the transaction process. Optional Information: From time to time we will put optional fields on the checkout form. These are used for research purposes only. Site Registration: Registration is not required in order to make a purchase from us. However, if you choose to register with us you will not have to reenter personal information upon prior visits. Registration also makes you eligible for various discounts and sales not available to other customers. It also allows us to tailor the site to you, and it allows you to access the “My Account” area of the site. Emails: You may opt-in to our email newsletter. From time to time we may send you information that we believe will interest you including special sales and offers not available to the general public. 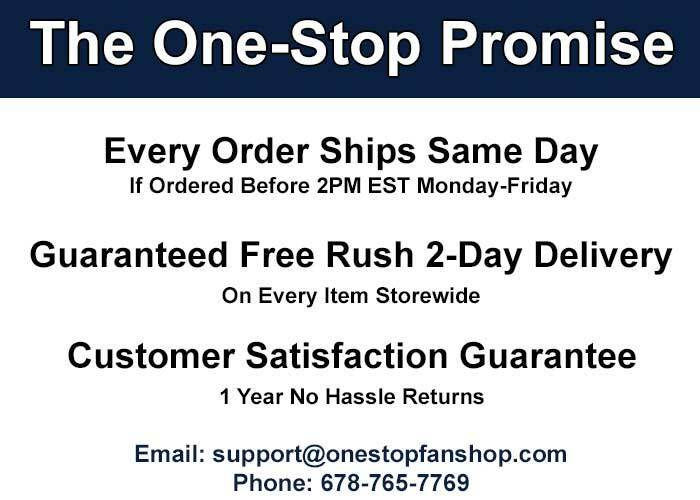 At any time you may opt-out of the email list by sending a request to support@onestopfanshop.com. We respect our customers and we do not share, sell, or abuse our customer email list. Marketing and Special Offers: When you opt in to the email list we will send you special offers from time to time. We respect your privacy and your inbox. We will not overwhelm you with emails, nor will we provide your address to anyone else. In order to process transactions we are required to disclose some personal information. This information is provided to certain service providers such as: your credit card issuer, third-party credit verification company, the product handler, and any delivery service. Any “direct from the manufacturer” purchases require us to provide your name and address to the manufacturer. Any request by law enforcement or government institutions to access your personal information will be handled in accordance with local, state, and federal law. We will always assist law enforcement officials if we have reasonable grounds to believe the information we provide will be useful in the investigation of unlawful activity. If you wish to access your personal information on file you may send a request to support@onestopfanshop.com. You will be given reasonable access to your information. Please help us maintain the accuracy of your information by notification of any changes. Children: We are committed to protecting the privacy of all visitors including children. We will not knowingly collect information from a child under the age of 13 in accordance with the Children’s Online Privacy Protection Act. If you are not an adult do not shop on our site. If you are a child you must ask your parent or legal guardian to assist you in using the site. Mergers or Acquisition: If Onestopfanshop Inc. is merged or acquired by another entity all personally identifiable information may be transferred to such entity. Contests and Promotions: In the event that you enter a contest or promotion provided by One Stop Fan Shop please read the applicable contest or promotion rules regarding the collection, use and disclosure of personal information. If there are any conflicts the specific contest or promotion literature will supersede this document.